The wheelhouse has two access doors, one port on starboard. Aft is a deck saloon & office with 2m headroom. 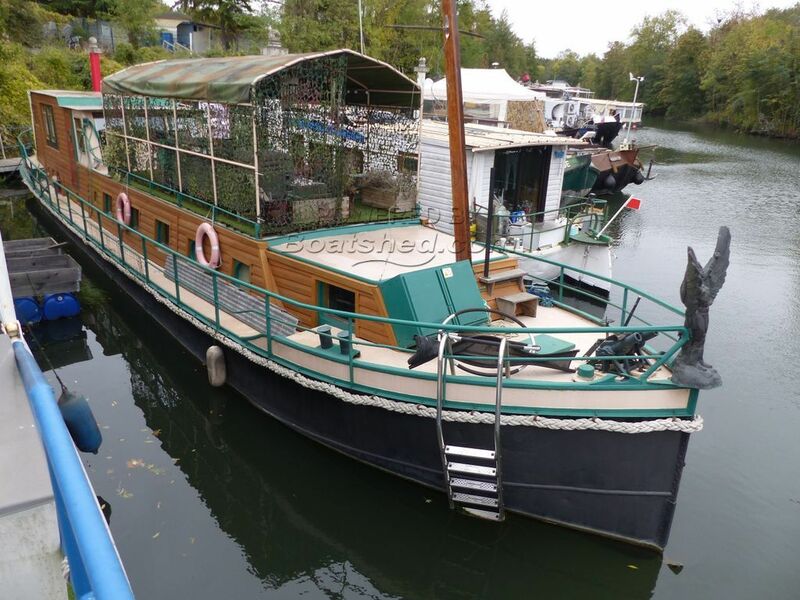 Down forward from the wheelhouse is the main accommodation with a lounge diner & kitchen bar. Library and main bedroom with double bed 1.9m x 1.4m and 2.2m headroom. The bathroom comprises a Spa bath basin & WC. Aft is the laundry room, storeroom, and engine room plus a day heads. Access to the machine room is by a watertight door. High ceilings and lots of light give a spacious feel to the cosy character of this most unusual residential barge. Hot water is from a 150 litre tank. Central heating is from a Kabola diesel fired boiler to radiators. The boat is equipped with black & grey water tanks. Outside on deck a convivial covered terrace. Manual winch with 35m chain & 85kg ancre.